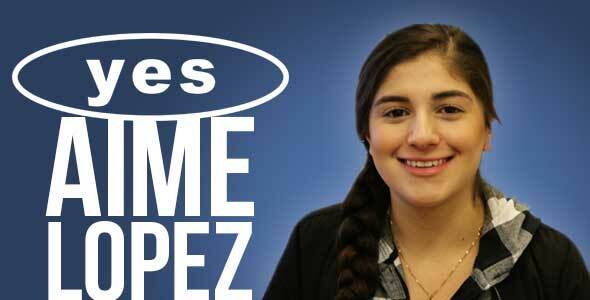 This month's employee spotlight belongs to a quiet, yet killer recruiter of ours in our Ogden office, Aime Lopez! Aime started with YES less than a year ago as a receptionist and has continually shown she is capable of so much more. She has since moved to a recruiter, and further on to an account manager and has been impressing our internal staff and our clients ever since! We appreciate the hard work and dedication that Aime brings to work every single day. I love my co-workers and the fun environment. A soda fountain in the break room! Probably my grandpa since I didn’t get the opportunity to meet him. 7. Never rolling your eyes again or never eating sweets again, which do you choose and why? Having to tell someone they don’t qualify for the job they want. Helping them find an alternative job that they do qualify for. I would tell them to be prepared to love your job. 11. Rumor is you enjoy a little bit of social media drama. Who would make a better social media/reality star? The president of YES Reed Laws or YES' CFO Kerry Westenskow? Why? I think they both would. In fact, a reality TV show about YES starring Reed & Kerry would be awesome. We wouldn't be the same without you, Aime! Thank you for all that you do!